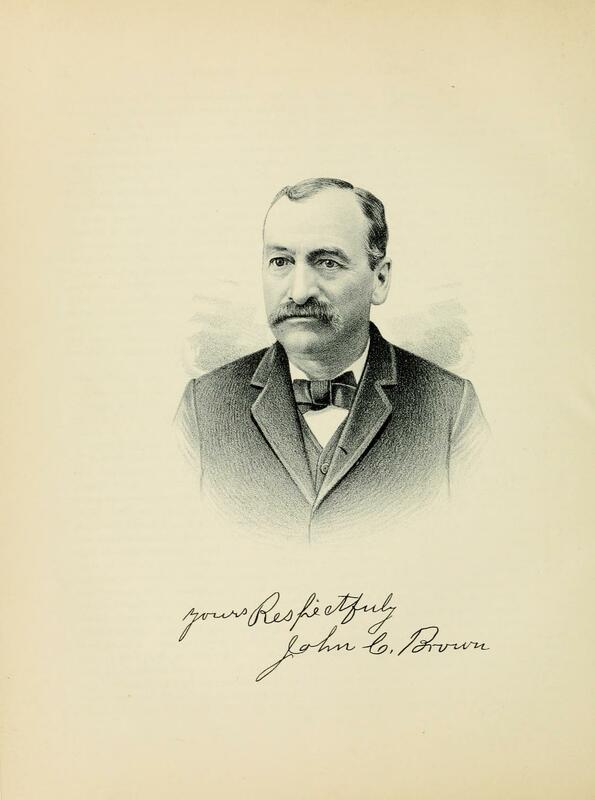 JOHN C. BROWN. A traveler throughout Shelby County would be forcibly impressed by some features of the estate owned and occupied by the subject of this biographical sketch. In approaching it his eyes would be attracted by the appearance ot order and thorough cultivation seen on every hand, as well as by the extent of the acreage and the efforts that have been made to add to its original beauty. Perhaps the most conspicuous object to the stranger would be the residence, a view of which is presented on another page of the volume. It is a commodious dwelling with the appearance of great comfort and homelikeness. In connection with this notice we are pleased to present to our readers a portrait of Mr. Brown, who is well known as an enterprising agriculturist and a reliable citizen. The fine tract of land which Mr. Brown operates is on sections 21, 22, 27 and 28, Ridge Township, and is not only in an excellent state of cultivation but is adorned with a splendid set of buildings. Before relating the principal events in the life of Mr. Brown it may be well to mention briefly the main facts in the history of those from whom he is descended. His father was a native of Wurtemburg, Germany, where he was born in 1805, and given the name of Christian F. He married Elizabeth Schearer, a native of Bavaria, who was born in 1814. After marriage they made their home in Tuscarawas County, Ohio, where they resided until 1864. At that time they removed to Clay County, Ind., where the father of our subject died in 1876. The mother still survives. Their family comprised nine children, John being the second in order of age. The natal day of our subject was April 10, 1837, and his birth occurred in Tuscarawas County, Ohio. There he grew to manhood and learned the trade of a blacksmith, taking his apprenticeship at New Philadelphia, Ohio. After serving for fifteen months he engaged as a journeyman, following his trade near his native county until the fall of 1864, when he removed to Clay County, Ind., and undertook the same work there. In February, 1865, he removed to Wilton Junction, Iowa, and there carried on his trade until June, 1865, when he returned to Clay County, Ind. In the spring of 1866 he removed to Shelby County and pursued his trade at what is now Henton, in Ridge Township. Here he worked until November, 1875, at which time he undertook agricultural pursuits, in which he is still engaged. He has erected a handsome set of buildings and has cleared a valuable farm of one hundred and eighty acres. He is known as one of the best wheat raisers in Shelby County, having raised as much as sixty-four bushels per acre, he also has been instrumental in introducing into the community the best varieties of wheat produced in the United States. John C. Brown and Georgiana Yost were married in Shelby County March 20, 1869. This lady is a daughter of George and Catherine (Harbaugh) Yost. Her father died in Nauvoo, Ill. Mrs. Brown was born, in Wooster, Wayne County, Ohio, May 20, 1845, and is the mother of five children: Edwin O.; Serepta, the wife of W. E. Coffman; Elizabeth, John C., Jr., and Grover C. It is unnecessary to name the politics of Mr. Brown to one who knows the name of his youngest son. He is a man who is active in all public matters, especially in political movements, and has filled a number of offices of responsibility. He was elected Supervisor of Ridge Township in the spring of 1890 for a term of two years. For ten years he has filled the office of Township Clerk and for twelve years has been School Director, serving as Clerk of the board during all that time. He is prominently identified with the Farmers' Mutual Benefit Association and has been Secretary for three terms of Pleasant Valley Lodge, No. 1735. He has done efficient service as Road Overseer for two terms. In all of these positions Mr. Brown has reflected credit upon himself and been active in promoting the welfare of the community. Extracted 26 May 2018 by Norma Hass from 1891 Portrait and Biographical Record of Shelby and Moultrie Counties Illinois, pages 528-530.